Intestinal ischemia and infarction occurs when there is a narrowing or blockage of one or more of the arteries that supply the small intestine. Hernia -- If the intestine moves into the wrong place or becomes tangled, it can cut off the blood flow. A lump in the abdomen is a small area of swelling or bulge of tissue in the belly. Adhesions -- The intestine may become trapped in scar tissue (adhesions) from past surgery. This can lead to loss of blood flow if left untreated. Adhesions are bands of scar-like tissue that form between two surfaces inside the body and cause them to stick together. Embolus -- Blood clots can block one of the arteries supplying the intestine. People who have had a heart attack or who have arrhythmias, such as atrial fibrillation, are at risk for this problem. Atrial fibrillation or flutter is a common type of abnormal heartbeat. The heart rhythm is fast and most often irregular. The arteries that supply blood to the bowel may become narrowed or blocked from cholesterol buildup. When this happens in the arteries to the heart, it causes a heart attack. When it happens in the arteries to the intestine, it causes intestinal ischemia. The veins carrying blood away from the intestine may become blocked by blood clots. This blocks blood flow in the intestine. This is more common in people with liver disease, cancer, or blood clotting disorders. Low blood pressure -- Very low blood pressure in people who already have narrowing of the intestinal arteries may also cause loss of blood flow to the intestine. This often occurs in people with other serious medical problems. Laboratory tests may show a high white blood cell (WBC) count (a marker of infection). There may be bleeding in the GI tract. These tests do not always detect the problem. Sometimes, the only way to detect intestinal ischemia is with a surgical procedure. In most cases, the condition needs to be treated with surgery. The section of intestine that has died is removed. The healthy remaining ends of the bowel are reconnected. In some cases, a colostomy or ileostomy is needed. The blockage of arteries to the intestine is corrected, if possible. 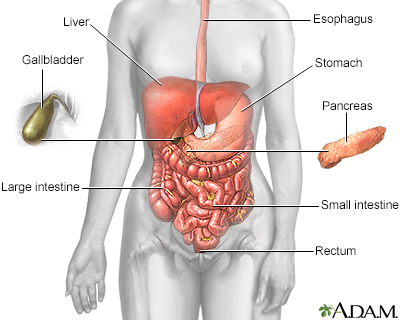 Damage or death of the bowel tissue is a serious condition. This can result in death if not treated right away. The outlook depends on the cause. Prompt treatment can lead to a good outcome. Damage or death of the bowel tissue may require a colostomy or ileostomy. This may be short-term or permanent. Peritonitis is common in these cases. People who have a large amount of tissue death in the intestine can have problems absorbing nutrients. They can become dependent on getting nutrition through their veins. Some people may become severely ill with fever and a bloodstream infection (sepsis). Eslami MH. Acute mesenteric ischemia. In: Cameron JL, Cameron AM, eds. Current Surgical Therapy. 12th ed. Philadelphia, PA: Elsevier; 2017:1071-1079. Roline CE, Reardon RF. Disorders of the small intestine. In: Walls RM, Hockberger RS, Gausche-Hill M, eds. Rosen's Emergency Medicine. 9th ed. Philadelphia, PA: Elsevier; 2018:chap 82. The small intestine is the portion of the digestive system most responsible for absorption of nutrients from food into the bloodstream. The pyloric sphincter governs the passage of partly digested food from the stomach into the duodenum. 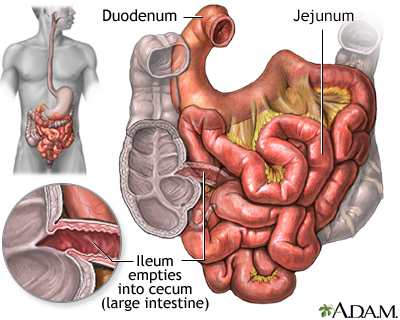 This short first portion of the small intestine is followed by the jejunum and the ileum. The ileocecal valve of the ileum passes digested material into the large intestine.